What do Frank Sinatra, Levi's Jeans and Don Knotts have in common? Special edition cars. When a trend gets too popular and a car company gets too desperate, they find ways to merge the two into a steaming pile of car crap — otherwise known as a trendy special edition. We thought we knew them all, but when we asked you about your favorite trendy special edition car we got quite the mix. 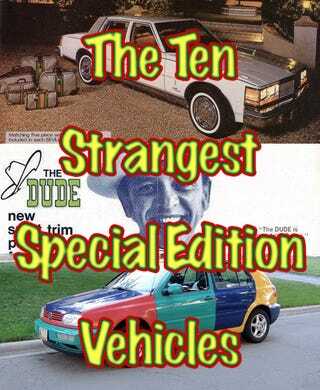 Below are the ten weirdest responses we received, complete with a poll so you can help us select the strangest special car of them all. What&apos;s Your Favorite Special Edition Trend Car? Chrysler Chairman Lee Iacocca had a friend in Frank Sinatra, and it was hoped that Old Blue Eyes could sing the company's way into the hearts of consumers. Not so much. But Iacocca did thank his friend by releasing the Frank Sinatra Edition Imperial Coupe, which featured a briefcase full of Sinatra tapes and a special silver-blue paint job. Despite the blessing of the former Rat Packer, people weren't biting and the FS edition was dropped, much to the dismay of MechiMike. The Japanese are often in the lead when it comes to automobile trends, so don't be surprised to see a Peppermint Patty Dodge Durango as a follow up to the Mitsubishi Pajero Snoopy Edition that Tonyola located for us. The vehicle is festooned in and out with drawings of snoopy as the flying ace, including on the wheel hub covers, spare tire compartment, speedometer, tachometer, pillars and door trim. There's also an autograph by Charles Schultz on the outside of the little SUV. We're not sure how much Schultz made for this, but it's not enough.